Does Gracilaria make a good habitat for local animals? Courtney spends a lot of time out in the field running experiments! 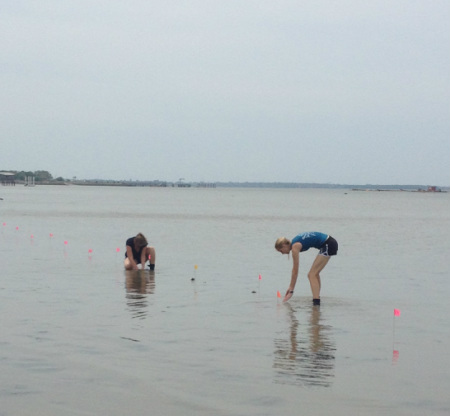 In this experiment, Courtney was trying to understand the relationship between the invasive seaweed, Gracilaria and other marsh organisms. Does Gracilaria act as a habitat for local marsh life? Courtney checking on her samples in the field. Courtney planned a 4 week long experiment this past April 2014. Two different tidal heights were selected for the locations of the experiment. Markers (orange flags) were placed 0.5 meters apart at each tidal height. 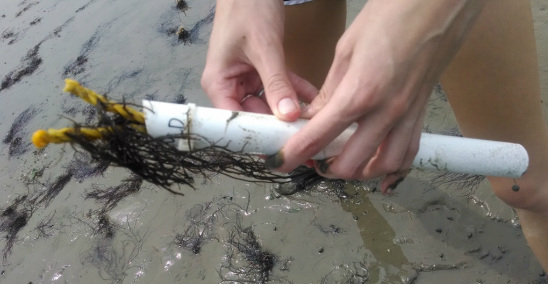 1.5 gram samples of Gracilaria attached to white tubes were pushed into the mud at each marker. The goal was to see if marsh plants and animals like amphipods are attracted to the seaweed for a habitat. After 4 weeks passed, samples were pulled up and immediately placed in plastic bags to catch mobile organisms. 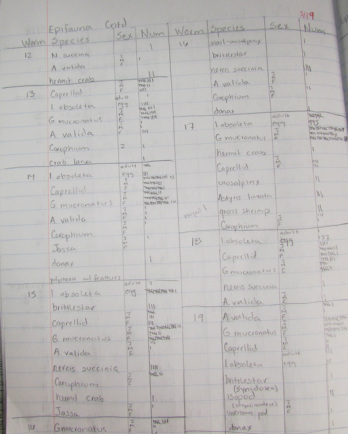 Organisms removed from each seaweed sample are labeled and stored. Samples were rinsed with fresh water to remove plants and animals attached to the seaweed. These organisms were placed in sealed containers with ethanol, a chemical used for preservation. Each Gracilaria sample was swabbed with a Q-tip to collect any bacteria that may have colonized during the 4 weeks. Bacteria will be frozen for preservation and counted later. Seaweed samples were placed in a lyophilizer, to freeze dry the samples. 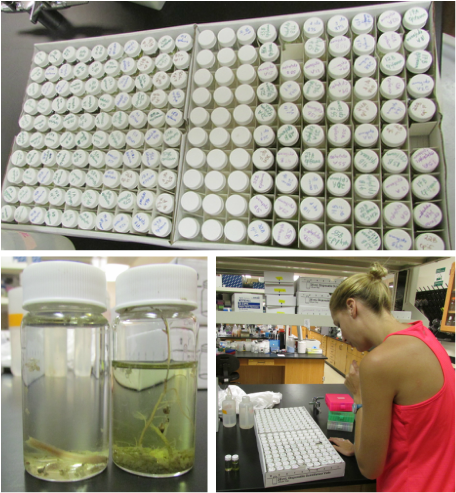 Dried samples were measured again to see if there were any changes in seaweed mass. Courtney keeps track of counting in her lab note book. 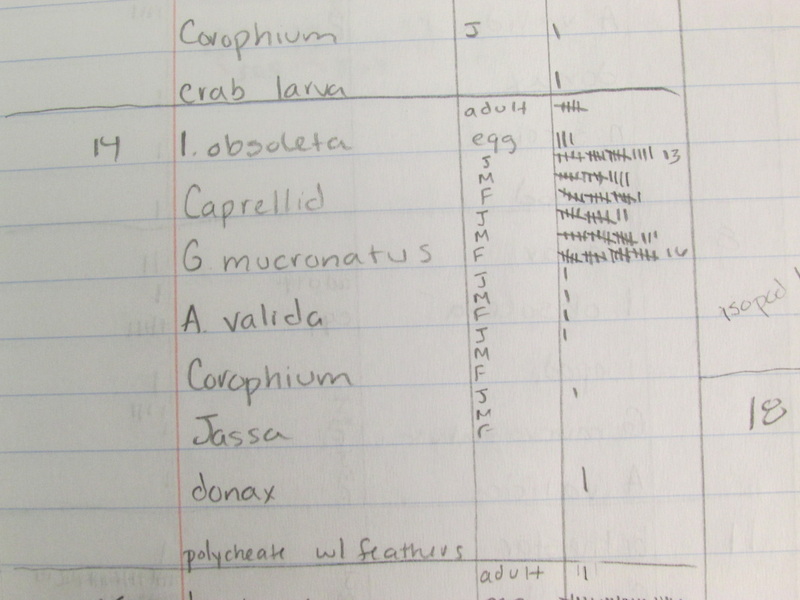 Some examples of species found and the tally marks of how many of each Courtney counted. Courtney has repeated this experiment several times throughout the year so that she can have an ongoing collection of data. After quantifying the amphipods found on her Gracilaria samples, Courtney created a graph to represent her data. Below is a graph showing the amount of amphipods found per gram Gracilaria in the marsh from June 2013-August 2014. This graph shows that there are significantly less amphipods in the summer-fall months and more amphipods in the winter. Why might that be? Discuss with your classmates.